Continue reading Middle East Peace Report - September 29, 2009. Washington, D.C - Americans for Peace Now (APN) praised President Obama's comments regarding Iran's construction of a covert uranium enrichment facility near the city of Qum. Continue reading APN Lauds Obama's Reaction to Iran Nuclear Developments. Continue reading APN Legislative Round-Up for the week ending September 25, 2009. Today's top story is of course the news about Iran. The bad news is that Iran's nuclear program clearly is continuing apace, with all of the threats that program poses to US national security interests and, of course, to Israel. The good news is that where in the past this development would have elicited a predictably one-dimensional response from the US -- outrage, denunciations, threats, saber-rattling, and statements that "Iran knows what it has to do, or else," (and perhaps even a rush to rash military action) -- President Obama has adopted a different course. President Obama today is sending a message to Iran -- and to the Iranian people -- that this issue must be resolved, and that there is before them a real and credible opportunity to resolve it through negotiations and engagement. To be sure, President Obama is not taking any options off the table, but by emphasizing the potential for engagement rather than for confrontation, he is adopting what APN has long argued is the most effective strategy for actually resolving the nuclear issue. Continue reading Obama's Got it Right (on the breaking news about Iran). (CNN) -- President Obama, in his address to the United Nations General Assembly on Wednesday, announced the next phase in America's efforts to finally end the decades-long Israeli-Arab conflict and remove one of the greatest destabilizing elements to America's national security interests from the Middle East playing field. Continue reading CNN: Huge Rewards for Middle East Peace. Jerusalem Post: "Tamir: Netiv Ha'avot outpost removes Gush from consensus"
"Peace Now claims that the entire outpost is built on private Palestinian land"
Touring the Netiv Ha'avot outpost in Gush Etzion along with other members of the Knesset's Foreign Affairs and Defense Committee on Wednesday, MK Yuli Tamir (Labor) confronted the settlers and reprimanded them for what she said was their illegal presence at the site. Continue reading Jerusalem Post: "Tamir: Netiv Ha'avot outpost removes Gush from consensus". Ynet: "Barak okays 37 more West Bank housing units"
Defense Minister Ehud Barak has authorized the construction of 37 additional housing units in the West Bank settlement of Karnei Shomron, Ynet learned on Wednesday. Continue reading Ynet: "Barak okays 37 more West Bank housing units". JTA: "Jewish groups, clerics back Obama peace efforts"
WASHINGTON (JTA) -- A number of Jewish groups and rabbis joined an open letter backing President Obama's intensive efforts toward a broader Middle East peace. Leaders of J Street, Americans for Peace Now and the Reconstructionist movement as well to former presidents of the Reform movement's Central Conference of American Rabbis signed the letter published Tuesday, saying that "we believe bold American leadership can help Israelis and Palestinians make the difficult decisions necessary to achieve lasting peace and hold the parties to account should they fail to honor their commitments." 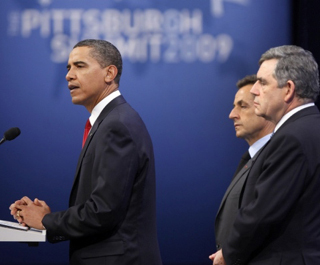 Continue reading JTA: "Jewish groups, clerics back Obama peace efforts". Continue reading Obama Speech to the UN - Middle East-related Excerpts. Continue reading IDF Forms New West Bank Command Unit to Confront Violent Settlers. Washington, D.C - Americans for Peace Now (APN) today welcomed President Obama's continued commitment to achieving Middle East peace, as expressed in his statement before the trilateral meeting with Israeli Prime Minister Benjamin Netanyahu and Palestinian President Mahmoud Abbas in New York. Continue reading APN Applauds Obama's Continued Commitment to Middle East Peace. MR. GIBBS: Good afternoon. Sorry we're running a little bit late today. We will do a statement from, and take some questions -- our Special Envoy for Middle East Peace, former Senator George Mitchell. SENATOR MITCHELL: Thank you, Robert. Good afternoon, ladies and gentlemen. I'll make a brief statement, and then I'll be pleased to respond to your questions. The President had direct and constructive meetings with both Prime Minister Netanyahu and President Abbas, and then he held his first trilateral meeting with the two leaders. As the President said, this was an important moment. Let me first give you some brief details. Each of the three meetings was about 40 minutes long. The tone was positive and determined. The President made clear his commitment to moving forward, and the leaders shared their commitment. In the meetings with Prime Minister Netanyahu and President Abbas, the President was joined by Secretary Clinton, General Jones, Tom Donilon and myself. For the trilateral meeting, the President was joined by Secretary Clinton, General Jones and myself. Continue reading Mitchell Press Briefing in NYC. The Chief Political Columnist for Ha'aretz discusses the impending "trilateral" meeting with President Obama, Prime Minister Netanyahu, and President Abbas, scheduled for New York on Wednesday, September 23. THE PRESIDENT: Please be seated, members of the delegations. I have just concluded frank and productive bilateral meetings with both Prime Minister Netanyahu and President Abbas. And I want to thank them both for appearing here today. I am now looking forward to this opportunity to hold the first meeting among the three of us since we took office. As I said throughout my campaign and at the beginning of my administration, the United States is committed to a just, lasting and comprehensive peace in the Middle East. That includes a settlement of the Israeli-Palestinian conflict that results in two states, Israel and Palestine, in which both the Israeli people and the Palestinian people can live in peace and security and realize their aspirations for a better life for their children. That is why my Secretary of State Hillary Clinton and my Special Envoy George Mitchell have worked tirelessly to create the context for permanent status negotiations. And we have made progress since I took office in January and since Israelis -- Israel's government took office in April. But we still have much further to go. Continue reading Obama Statement at Beginning of Trilateral with Netanyahu and Abbas. APN's president and CEO Debra DeLee today joined a group of American Jewish, Christian and Muslim community leaders who signed an open letter supporting President Obama's Middle East policy. We come from varied ethnic backgrounds and religious faiths that are diverse. We are Democrats and Republicans. We are veterans of war and of the struggle for peace. Together, we are all Americans. Continue reading DeLee joins US Jewish, Christian, Muslim leaders; Signs letter supporting Obama's Mideast policy. BBC: "An Israeli settlement in close-up"
"It's not normal or natural growth, it's a dramatic expansion for a new kind of population," says Hagit Ofran, of the Israeli group Peace Now, which campaigns against settlements. As Israeli, Palestinian and US leaders meet again in the long-running saga of Middle East peace talks, the BBC's Martin Asser examines one of the thorniest issues on the agenda. In the first of two articles, he visits an Israeli settlement in the West Bank undergoing a major expansion. Continue reading BBC: "An Israeli settlement in close-up". A Three-Way Summit: President Barack Obama will host Israeli Prime Minister Benjamin Netanyahu and Palestinian President Mahmoud Abbas for a summit meeting tomorrow night in New York. Continue reading Middle East Peace Report - September 21, 2009. Alpher responds to questions on what Obama can achieve during a meeting with Netanyahu and Abbas in New York this week, and the fairness of the Goldstone Report. Continue reading Hard Questions, Tough Answers with Yossi Alpher - September 21, 2009. Jerusalem Post: "Jews, activists unite ahead of UN parley"
When Iranian President Mahmoud Ahmadinejad enters the United Nations to give his General Assembly address in New York this week, he will face an unprecedented coalition of Jewish, Iranian, labor, African-American and other activists demonstrating against his regime. Continue reading Jerusalem Post: "Jews, activists unite ahead of UN parley". Washington and Jerusalem look closer today to a deal on freezing Israel's West Bank settlement construction than they've been in years. Last week, George Mitchell, the U.S. envoy, suggested that an agreement was imminent, and most observers expect at least a nine-month hiatus to start soon. Even the Israeli government's recent decision to approve 455 new housing units may be a sign that it knows a deal is coming and wants to get a few more buildings in before the deadline. Continue reading Newsweek: Batman in Jerusalem. The Days of Awe have not yet started, but I am already repenting. I regret that I will not spend Rosh Hashana with my parents in Jerusalem and that I will probably not have a chance to cook the traditional dishes for the Rosh Hashana "blessings." It's a charming (and delicious) Sephardi tradition. Before the festive holiday meal, Sephardi families serve a collection of appetizers, tapas of sorts, and bless over each one. Continue reading In this New Year, Be Careful with Words. Forward: "Broadened Coalition To Protest Iran This Year at United Nations"
APN's CEO and President Debra DeLee said that "now is the time to look for ways to signal positive U.S. support for the Iranian people, not to create suffering in order to use that suffering as a weapon against the Iranian leadership." Washington -- As world leaders converge on New York for the annual opening of the United Nations' new session, advocates and Jewish groups are seeking to broaden the coalition that has in years past protested the Tehran regime to include many additional groups that share grievances against Iran. Continue reading Forward: "Broadened Coalition To Protest Iran This Year at United Nations". To readers of the Round-Up, wishing you a Shana Tova -- Happy New Year. May this year be a year of peace. Continue reading APN Legislative Round-Up for the week ending September 18, 2009 . The result is on page 14 of this week's Newsweek. Check it out. Continue reading APN Serves as Source for Newsweek Map of West Bank Settlements. Jerusalem Post: "Young Israelis of the year: Michael Sfard, 37: A lawyer and a gentleman"
Key lawyer working on behalf of Peace Now named one of the "Israelis of the year"
On a recent roots trip to Poland, from where his parents immigrated in 1968, Michael Sfard found a lithograph which summed up in one picture what his professional life as a human rights lawyer is all about. Continue reading Jerusalem Post: "Young Israelis of the year: Michael Sfard, 37: A lawyer and a gentleman". Foreign Policy in Focus: "Obama's Israel-Palestine Gamble"
Lara Friedman, Director of Policy and Government Relations at Americans for Peace Now (APN), sees political wisdom in the unpredictability: "Obama is smart to not lay out specific parameters, since any 'Obama parameters' would then just become the focus of the debate." 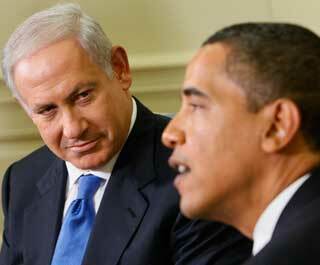 Continue reading Foreign Policy in Focus: "Obama's Israel-Palestine Gamble". NY Jewish News: "Intense lobbying effort gets bipartisan backing"
"Crippling sanctions" could give "the Iranian authorities a pretext to discredit and further persecute critics and protesters," APN warned, "and make the lives of the Iranian people more difficult." Local Jewish leaders joined an intense lobbying effort in Washington last week, joining some 300 colleagues in winning bipartisan congressional support for strengthening sanctions against Iran. Continue reading NY Jewish News: "Intense lobbying effort gets bipartisan backing". On Friday night, September 18, Jews around the world began celebrating Rosh Hashanah, the start of the Jewish New Year. 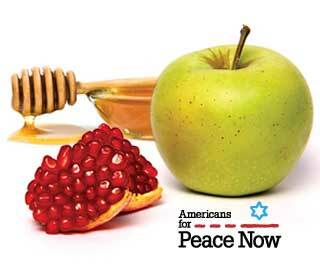 Americans for Peace Now hopes that the new year will be a sweet one. May it be a year of emerging peace. Continue reading The Goldstone Report & Devastation in Gaza. JTA: "Groups set to confront Ahmadinejad as U.S. agrees to talks"
"...Americans of Peace Now (has) criticized the sanctions strategy, saying it would undermine the Obama administration's diplomatic efforts." WASHINGTON (JTA) -- As they prepare to protest the appearance of Iran's president at the United Nations General Assembly, Jewish groups are working to decipher the impact of the Obama administration's decision to hold talks with the Islamic Republic. Continue reading JTA: "Groups set to confront Ahmadinejad as U.S. agrees to talks". New York Times Editorial: "Squandering the Moment"
Unless something happens soon, Israelis, Palestinians and other Arabs may squander the best chance for Middle East peace in nearly a decade. President Obama is committed to serious negotiations and, for now, there is a lull in regional violence. But all of the region's major players are refusing to do what is needed to keep their own people safe and move the peace process forward. Continue reading New York Times Editorial: "Squandering the Moment". The Israeli Peace Now movement today released the three finalists from its video competition. These videos were made by Peace Now activists. Continue reading Video Contest Finalists (from Israel). When Will Israeli-Palestinian Talks Renew? ; The Fierce Urgency of Peace; Settler Campaign Falls Flat; Who is a Sucker? ; What to Make of the Iranian Proposal? ; Did Netanyahu Agree to Withdraw from the Golan Heights? Continue reading Middle East Peace Report - September 14, 2009. Alpher responds to question on where the broader Obama plan for the Middle East stands, and the level of unrest anticipated if West Bank Settlers are evacuated. Continue reading Hard Questions, Tough Answers with Yossi Alpher - September 14, 2009. APN today applauded the Obama Administration's decision to respond positively to the recent Iranian package of proposals for opening a dialogue with the international community. Continue reading APN Commends Obama Administration for Positive Response to Iranian Proposal. Americans for Peace Now joins the Ramon family and the state of Israel in mourning the death of Assaf Ramon, an IDF fighter pilot and the son of Israel's first Astronaut and decorated fighter pilot, Ilan Ramon, who was killed in 2003 aboard the Columbia Space Shuttle. Captain Assaf Ramon was killed yesterday when an F-16 fighter-jet he was piloting crashed during training. "This is a terrible tragedy for the Ramon family and for Israelis who followed with pride and awe as Assaf followed in his father's footsteps," said Debra DeLee, APN's president and CEO. "We salute the memory of Ilan and Assaf Ramon," DeLee said. APN takes this opportunity to wish all Israelis and their neighbors a year with no sorrow, a year of emerging peace. To Israel's Muslim citizens and to Muslims across the region, APN wishes a peaceful Id al-Fitr. May this holiday mark new beginnings of peace, security and stability for the Middle East. Continue reading APN Legislative Round-Up - September 11, 2009 . IPS: "US-IRAN: War Drums Begin Beating in Washington"
Americans for Peace Now (APN), for instance, issued a statement arguing that "arbitrary deadlines are a mistake" and that "pursuing sanctions that target the Iranian people, rather than their leaders, is a morally and strategically perilous path that the Obama Administration must reject". WASHINGTON, Sep 11 (IPS) - As nuclear negotiations between Iran and the West continue to move slowly, U.S. President Barack Obama is coming under growing pressure from what appears to be a concerted lobbying and media campaign urging him to act more aggressively to stop Iran's nuclear programme. Continue reading IPS: "US-IRAN: War Drums Begin Beating in Washington". Iran's Response to invitation to talks: not "No" but "Game On"
Earlier this week we released new policy language calling for a US strategy of sustained, serious engagement with Iran. Around the same time, Iran issued its http://documents.propublica.org/docs/iran-nuclear-program-proposal/original.pdf (link has expired) response to the latest international call for negotiations. As NIAC's Patrick Disney writes in an excellent analysis of the Iranian document, " The [Iranian] proposal was somewhat disappointing, though by no means closed the door on constructive engagement. Unfortunately, by the time the actual document was released, the media and many policymakers had already made up their minds about what the package said, based on accounts from western diplomats..." Patrick concludes his post with the following: "..To characterize this document as a 'rejection' of negotiations, or as 'ignoring' the key issues is disingenuous and false. Period." For more analysis of the Iranian proposal and what it actually means (and the opportunity it represents), read the ever-brilliant Trita Parsi here. We encourage people to actually read the Iranian http://documents.propublica.org/docs/iran-nuclear-program-proposal/original.pdf (link has expired) response for themselves. Is it everything the US had hoped for? Of course not. Does that mean it is proof that engagement is pointless and should be cut short? Of course not. What it means is that the game is on - supporting our view that the way forward is not mis-targeted sanctions and unrealistic, arbitrary deadlines. Rather, it is smart engagement, characterized by realistic goals and expectations and a readiness to adapt as the engagement process proceeds. President George W. Bush adopted a strategy toward Iran based on trying to threaten, browbeat and sanction Iran into submission. This strategy failed to stop Iran's nuclear program or end its reckless meddling in the region. President Barack Obama came to office promising to change course and engage Iran. He was right. Serious, sustained, direct U.S. engagement with Iran is now needed to address the full range of issues on the U.S.-Iran agenda. Unfortunately, many are now calling for a deadline to end engagement efforts and new "crippling sanctions" that target the Iranian people. In the video below, APN's Lara Friedman and Ori Nir clarify these issues. Click here to write Congress. Ask them to support Obama's approach to Iran. Jerusalem Post: "US Jews push Obama to act on Iran"
APN President and CEO Debra DeLee: "...additional sanctions aimed squarely at the ruling regime and its members may make sense, but that the US must not make the mistake of pursuing sanctions that target the Iranian people - like the 'crippling' sanctions currently under consideration." Continue reading Jerusalem Post: "US Jews push Obama to act on Iran". Did Bibi Agree to a Full Withdrawal from the Golan? Did Prime Minister Binyamin Netanyahu, during his first term as prime minister in the late 1990s, agree to a full Israeli withdrawal from the Golan Heights in exchange for a peace agreement with Syria? Some, who were involved in the secret communications between Netanyahu and Hafez al-Assad, who was then the president of Syria, say he did. Netanyahu denies. Continue reading Did Bibi Agree to a Full Withdrawal from the Golan? . Jerusalem Post: "Likud rally against settlement freeze fizzles"
"Protesters from Peace Now and the right-wing Hatikva party demonstrated outside the event. Peace Now activists handed out ice pops to celebrate the settlement freeze." Continue reading Jerusalem Post: "Likud rally against settlement freeze fizzles". Continue reading APN: It's Time for an Iran Strategy that Makes Sense, Not "Crippling" Sanctions and Unrealistic Deadlines. For those who believe in Mideast peace, Iran remains an issue of central importance, and our policy on Iran represents the only effective approach for dealing with Iran - one that looks soberly at the current situation and offers the most pragmatic, constructive, and effective way forward. Continue reading Engaging Iran, Promoting Peace. Alpher responds to a question on PM Netanyahu's decision to sanction more settlement construction and his capacity to manage a peace process, and on the substance of Arab CBM's (Confidence Building Measures) towards Israel. Continue reading Hard Questions, Tough Answers with Yossi Alpher - September 8, 2009. Wall Street Journal: "West Bank Settlement Plans Strain Peace Efforts"
MAALE ADUMIM, West Bank -- Jewish settlers scuffled with Israeli peace activists in the West Bank on Monday hours after Minister of Defense Ehud Barak approved plans for 455 housing units in the territory, adding to the tension surrounding what has become the most contentious issue of the Obama-led peace process. Continue reading Wall Street Journal: "West Bank Settlement Plans Strain Peace Efforts". JTA: "Activists dedicate controversial area"
JERUSALEM (JTA) -- Hundreds of activists attended a symbolic groundbreaking ceremony for a new neighborhood connecting the West Bank city of Maaleh Adumim with Jerusalem. A government minister from each of the Likud, Yisrael Beiteinu and Habayit Hayehudi parties attended Monday's ceremony in the controversial E-1 area, the Jerusalem Post reported. Continue reading JTA: "Activists dedicate controversial area". New York Times: "Israel Authorizes New Settler Homes in West Bank"
JERUSALEM (Reuters) - Israel approved on Monday the building of 455 settler homes in the occupied West Bank, a move opposed by its U.S. ally and Palestinians but which could pave the way for a construction moratorium sought by Washington. Continue reading New York Times: "Israel Authorizes New Settler Homes in West Bank". Ynet: "New neighborhood launched in disputed E1 area"
Continue reading Ynet: "New neighborhood launched in disputed E1 area". Aides to Binyamin Netanyahu told the media on September 3rd that the Israeli prime minister will approve building hundreds of new homes in West Bank settlements before he considers a settlement freeze. Early the next day, the White House issued a stern message telling Bibi that he cannot have the cake and eat it too. Continue reading White House to Bibi: No More Settlement Construction. Last week, I sent out an Action Alert to APN activists who live in Rep. Howard Berman's district to call on him to clear the record after a media report suggested that he opposed President Barack Obama's stance on a settlement freeze. Today, we see the fruit of our activism. Continue reading Success! Berman clears the record on settlements. At a time when the Obama administration is seeking a way to impose a construction freeze in the settlements that will be acceptable to both Israelis and Palestinians, in order to pave the way for the resumption of the political process, Prime Minister Benjamin Netanyahu is seeking common ground with the settlers. Continue reading Haaretz Editorial: Tell the Settlers the Truth. Earlier this summer, I had a thorny exchange with Zalman Shoval, a political advisor to Israeli Prime Minister Binyamin Netanyahu and formerly Israel's ambassador to Washington. Continue reading Peace Now's Effectiveness Threatens the Right. All of us who believe in Israel and in peace wonder sometimes if enough progress is being made toward our goals. There has been progress, and friends of Americans for Peace Now can take a lot of the credit. Continue reading "Hope Without Delusion" - Letter from Professor Mark Rosenblum.